Last week, Baltimore Orioles outfielder Adam Jones blasted the concept of stadium bans, referring to such suspensions as a “slap on the wrist” following the team’s May 1 game against the Boston Red Sox at Fenway Park. According to Jones, fans at the historic ballpark taunted him with racial epithets during the Orioles’ 5-2 win, with one throwing a bag of peanuts at Jones as he made his way to the dugout. Red Sox president Sam Kennedy told MassLive.com that 34 fans were removed from the game, including 20 who were tossed for alcohol-related reasons. It’s unclear how many of those ejected engaged in the reported abuse of Jones — or how many fans are kicked out of an average game — but the Boston Globe reported that one fan was banned for life by the stadium. Regardless, Jones argued that neither penalty is harsh enough to end the behavior. “It’s pathetic,” Jones said, according to USA Today. “It’s called a coward. What they need to do is that instead of kicking them out of the stadium, they need to fine them 10 grand, 20 grand, 30 grand. Something that really hurts somebody. Make them pay in full. And if they don’t, take it out of their check. According to experts in the field, it doesn’t necessarily mean much — and while bans are usually effective, they aren’t a foolproof way to keep troublesome fans from returning, especially if they’re determined to get back in. Different states, leagues and teams have varying policies, but typically speaking, a violator facing a stadium ban is forced to sign paperwork before leaving the building agreeing to their own prohibition. In addition, any future tickets purchased by that fan are voided, and should that person return while the ban is still in place, he or she would be subject to arrest for criminal trespass. However, while the threat of incarceration is certainly a deterrent, enforcement can be challenging. To help catch banned spectators, ballparks, stadiums and arenas will often distribute images of banned fans to security staff. But while employees remain mindful of blacklisted fans attempting to attend a game undetected, those faces can be tough to spot among the thousands who flood the building’s gates. “Security and guest services are there to make the event enjoyable,” sports security expert James DeMeo, founder of Unified Sports & Entertainment Security Consulting, said. 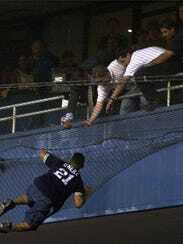 “But they also obviously have that duty of care to make sure the fans are safe. At the University of Southern Mississippi, students and faculty at the National Center for Spectator Sports Safety and Security work specifically toward the goal of improving security at sporting events. Launched in 2006 on a grant from the Department of Homeland Security, the Center researches the impact of spectator-related incidents nationwide and has provided training and certification to more than 5,000 security professionals and nearly 1,000 universities. “We constantly look at people, processes and technologies to see if we can try to solve problems,” Lou Marciani, the Center’s director, told FOX Sports. “This incident in Boston will trigger new best practices, it will trigger new rules and regulations from the leagues, and it will drive technology to the lab here, so we can begin to, long-term, solve the problem. Another approach that could take the pressure off hired personnel and help nab unwanted fans is the use of facial-recognition programs and other biometric software, but implementing that emerging technology is costly and is far from a cure-all. “In order to do facial recognition, first of all I have to have a good, clear picture (of the subject),” Donovan said. “Then I load the picture into my system, I’ve got a database of known offenders, and certain cameras, when set up correctly, are fixed on a focus area, and you can run facial recognition off of that and flag those people. With time, such systems will become more commonplace — ”I think it’s coming,” Donovan said, “and it’s going to come quickly” — but for now the onus still rests largely on the security and guest services representatives manning the building’s front line. Fortunately for the teams and leagues that occupy these spaces, simply asking fans to leave and not come back is almost always enough to keep them away from good. Counter-terror police investigating the Manchester Arena bombing have carried out fresh raids today, as security services brace for more attacks during the Muslim holy month of Ramadan beginning tomorrow. Islamic State has called on its followers to rise up in an “all-out war” on “infidels” in the West. Saturday marks the start of a 30-day period of fasting and reflection in the Islamic world, which has in recent years seen a large increase in terror attacks. 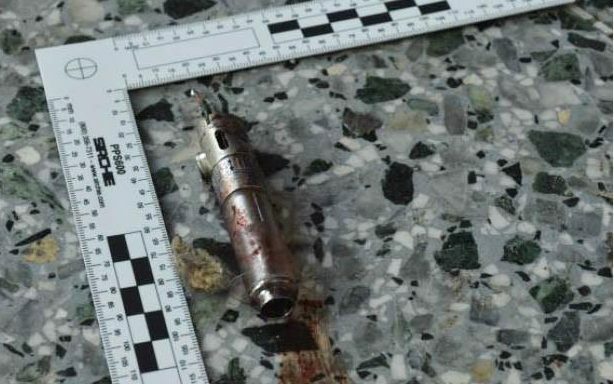 Officers who earlier raided terrorist Salman Abedi’s home discovered a working bomb factory with a huge stash of explosive chemicals and other components. Police today revealed that the eight men in custody “on suspicion of offences contrary to the Terrorism Act” in connection with Monday’s atrocity, which killed 22 people – including seven children – are aged between 18 and 38. British police have resumed “working closely” with US authorities on the probe after a tense showdown between the allies over leaked intelligence. After Theresa May warned the transatlantic row risked hampering the “special relationship” between the UK and America, US Secretary of State is making his first official trip to Britain today. With Britain on critical alert, stay with us for the latest updates today amid the huge operation to dismantle a suspected “network” linked to Abedi. Major League Baseball in Dec. 2015 recommended its stadiums extend the netting that backs up the home plate area to the near end of the dugouts in an attempt to better project fans from foul balls or flying or broken bats, and a handful of teams have done so. The suit against the Braves says the Braves and MLB “chose to rely on a 1920s-era building code” that allows rails to be as low as 26 inches if the spectators are seated. It notes that this was designed mainly for theaters and symphony halls to set railings where they wouldn’t impede patrons’ views. 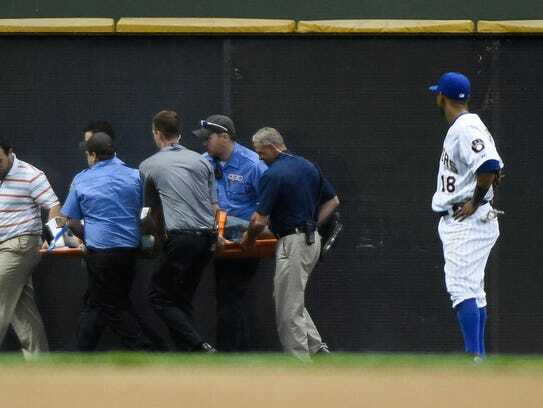 A man who struck his head after tumbling over a railing at Chicago’s Wrigley Field has died. The Cook County medical examiner’s office says 42-year-old Richard E. Garrity of Wheaton was pronounced dead Wednesday at Advocate Illinois Masonic Medical Center. Authorities say Garrity fell over a railing after Tuesday night’s game between the Chicago Cubs and Cincinnati Reds. Police say he suffered head trauma from the fall. The medical examiner has scheduled an autopsy for Thursday to determine the cause of death. New Campus Gun Laws Have Colleges Shopping for Metal Detectors. New Campus Gun Laws Have Colleges Shopping for Metal Detectors. For Big Schools, the Bills Are Eye-Popping. Plans call for ponying up $1 million — and that’s just for the football stadium. Sports stadiums and hospitals will be among the last remaining gun-free areas at public colleges and universities in Kansas and Arkansas when new laws governing firearms on campus go into effect in those states. But the sanctuaries are going to come with hefty price tags. The campus-carry laws in Kansas and Arkansas go further than those in other states by requiring schools that want to continue to prohibit firearms in certain facilities to install security measures, including metal detectors and barricades. Officials at three Kansas universities have estimated the cost of updating their primary athletic venues at more than $2 million. That estimate does not include the cost of staffing the new security checkpoints. Public colleges in Arkansas have yet to release cost projections for the security apparatuses they will be required to buy in order to keep their stadiums and arenas gun-free. But an independent security consultant contacted by The Trace put the price tag of outfitting the University of Arkansas’s flagship stadium with metal detectors at nearly $500,000. School officials in the affected states say the upshot of the policies are clear: If universities want to prohibit guns in sensitive spaces, they’re going to have to find a way to absorb significant new costs. Starting July 1, anyone over 21 will be allowed to carry a firearm onto university grounds in Kansas. It is set to become the first state where both campus carry and so-called permitless carry are legal. Gun owners will be able to bring guns onto campus even if they have not obtained a concealed-carry license, a process that entails eight hours of training. Kansas’s campus-carry law says that public colleges that want to prohibit firearms in designated buildings after the law goes into effect must install “adequate security measures to ensure that no weapons are permitted to be carried into such building.” The law spells out “adequate” to include both metal sensors and the personnel to staff them. Institutions under the umbrella of the Kansas Board of Regents maintain more than 800 buildings. The largest of those buildings are sports arenas, many of which also serve alcohol. The University of Kansas, Kansas State University, and Wichita State University are home to prominent Division 1 athletic programs whose football teams play in stadiums that hold as many as 50,000 spectators each. Accordingly, university leaders have made athletic facilities their first priority as they scramble to keep guns out of the bleachers while ensuring that their schools are also in compliance with the pending law. On April 19, the Kansas Board of Regents accepted proposals from those three universities for installing security measures at their stadiums. Wichita State was granted approval for up to 20 mobile metal detectors at an estimated cost of $72,000. Brad Pittman, the school’s associate athletic director, sees the expense as less a product of the new law than an emblem of the times. Kansas State University in Manhattan got the go-ahead for 70 mobile detectors for its two sports stadiums, as well as two other event halls and the campus art museum. After the meeting, an official from the school’s athletic department estimated the cost at $1 million. The University of Kansas’s plan calls for purchasing the necessary equipment to secure events with anticipated attendance of 5,000 or more. Jim Marchiony, the university’s associate athletic director, said his department also anticipates costs running into the seven figures. Also underway at the University of Kansas, according to attorneys for the school, are plans for preserving the gun bans in place for child care centers and certain areas of the university’s medical center in Lawrence. The schools are taking on the added costs even as state rollbacks to higher education funding have them contemplating academic cuts and possible tuition hikes of up to 5 percent. Richardson, the spokesperson for the Board of Regents, said funding for security equipment at stadiums would likely come directly from athletic departments, which are less reliant on state support because they generate revenue from ticket sales and private donations. Kansas’s campus-carry law was passed in 2013 as part of a broad bill to allow guns in public places. While the law went into effect months after it was signed, universities were given a lengthy extension to comply. An effort by Democratic lawmakers to permanently exempt universities failed this spring. Higher education officials in Arkansas, by comparison, have had far shorter notice. Governor Asa Hutchinson, a Republican, signed his state’s campus-carry law on April 4, and it will go into effect on January 1. The campus-carry law in Arkansas sparked turmoil after an earlier version that opened all campus areas — including stadiums — to concealed guns. Facing outrage from constituents and officials worried about the prospect of sanctions from the Southeastern Conference and National Collegiate Athletic Association against the University of Arkansas’s sports teams, legislators quickly passed an amended version of the law. The final statute incorporated an opt-out provision similar to that of Kansas: public colleges that want to keep “firearms sensitive” areas gun-free have to pay for security features and have a safety plan approved by the State Police. Nate Hinkel, a spokesperson for the University of Arkansas in Fayetteville, the state’s largest public college, said the administration has not yet drafted a proposal for adding security measures at the Donald W. Reynolds Razorback Stadium, which seats 72,000. While the University of Arkansas prepares its plan, The Trace sought a ballpark figure (as it were) from Jeff Miller, who serves as executive vice president of New York-based MSA Security and formerly advised National Football League teams on venue safety. He estimated the costs for equipping Razorback Stadium with metal detectors at upwards of $450,000. He arrived at that figure by following the general protocol of allotting one metal detector per 1,000 attendees. A going rate for a walk-through detector is around $6,500, though Miller noted that prices vary by manufacturer. Though Idaho’s 2014 campus-carry law does not mandate metal detectors for gun-free facilities, Boise State University took the step of installing them anyway. The 54 metal detectors it purchased for its 14,500 capacity football stadium ran $250,000, according to John Uda, the university’s assistant director of event security. Setting up and staffing the machines costs $20,000 per game. Renting tents to cover the metal detectors runs another $3,500. The barriers that corral fans as they wait to be screened add another $2,500. “If you’re going to do it, do it right,” Uda said. He had a prediction for his counterparts in Kansas and Arkansas when the first full invoices arrive. “They’re in for a shock,” he said. BOSTON — Major League Baseball is reviewing its security protocols in all 30 stadiums after Orioles outfielder Adam Jones complained of fans shouting racial slurs in Boston this week and other black players reacted by saying it’s a common reality when playing in several cities. It’s not yet clear what changes might be made, but league officials are starting by figuring out how individual clubs handle fan issues and complaints. All MLB teams have a mechanism for fans to alert security to issues, but individualized ballparks mean different protocols and practices in each stadium. In Boston, Jones complained Monday night that he heard the N-word several times and that someone threw peanuts toward him in the dugout. Boston Red Sox officials apologized and said that only one of 34 fans kicked out of the game was ejected for using foul language toward a player, and it wasn’t clear whether that was toward Jones. 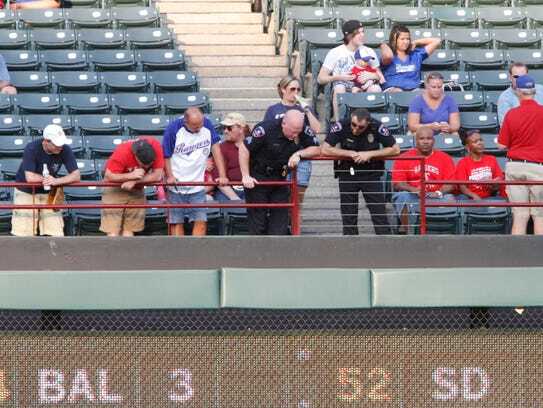 Boston police said the peanuts hit a nearby police officer and Fenway security kicked the man who threw them out before he could be identified by authorities. But after Jones spoke out, black players around the league made it clear that what he experienced is an ongoing experience during road trips, varying by ballpark. Dusty Baker, the Nationals manager who played 19 seasons, said Jones’ complaints weren’t surprising because he’s been targeted with racial slurs in almost every city he played in. “Minor leagues, big leagues … from L.A. to New York, it’s more apparent in some places than other places,” Baker said. Yankees pitcher C.C. Sabathia said he heard racial slurs from fans when he pitched for the Indians in Boston, but has never had a problem with New York, where security guards follow players out to the bullpen and maintain a visible presence. Kemp said he spoke to security officials about a week ago about how things were getting out of hand. One model could be in some European soccer leagues, where clubs are held responsible for the actions of their fans. Soccer authorities have spent decades trying to eradicate racism from stadiums, with limited success. Sanctions were strengthened in 2013 after a high-profile incident in Italy saw Kevin-Prince Boateng lead his AC Milan team off a field after facing abuse from fans. Parts of stadiums can be closed during matches after a first instance of abuse, while repeated abuse can result in fans being locked out of games completely. Still, during a Serie A game in Italy on Sunday, Pescara player Sulley Muntari complained he was being racially abused by Cagliari supporters and the referee’s only action was to penalize Muntari for his protests and show him a second yellow card as he walked off the field — which amounted to a red card kicking him out of the game and his team’s next game. The league didn’t punish Cagliari because it said only 10 fans were hurling the abuse, despite a clear sliding scale of punishments for four years. FIFA, soccer’s global governing body, has also given leagues the power to dock points or relegate teams for serious repeated racist incidents. Players also face a minimum 10-game ban in Europe if they racially abuse opponents. But FIFA has been criticized for disbanding its anti-racism task force even as it prepares to take the World Cup in 2018 to Russia, where racism continues to blight matches. Hall of Famer and Yankees senior adviser Reggie Jackson said improving security at ballparks might not be a magic wand. The Boston Red Sox have permanently banned from Fenway Park a man they said used a racial slur, a separate confrontation from the insults directed at Baltimore Orioles outfielder Adam Jones a night earlier but one the team says it is taking just as seriously. “I’m here to send a message, loud and clear, that the behavior, the language, the treatment of others that you’ve heard about and read about is not acceptable,” Red Sox president Sam Kennedy said during an impromptu update for reporters in the back of the press box during Wednesday night’s game. We have to recognize that this exists in our culture. It’s not indicative of Boston. … It’s a handful of ignorant and intolerant people. One night after Jones spoke out about being called the N word by a fan in the Fenway stands, rekindling the debate about the city’s mixed history of racial tolerance, the ballpark was the site of another racist encounter. Calvin Hennick, a Boston resident bringing his son to his first Red Sox game as a present for his sixth birthday, wrote on Facebook on Wednesday night that a neighboring fan used a variant of the N word when referring to the national anthem singer — a Kenyan woman. Surprised, Hennick asked him to repeat it, and the other fan did. Hennick, who is white, was at the game with his father-in-law, who is originally from Haiti, and his biracial son. At first he assumed the other fan mistook him for a kindred spirit, Hennick said, but now he believes the man was reacting to the uproar over Jones. I was sitting there with my mixed-race family. The more I think about it, the more I think it was a deliberate thumb in the eye. He wanted to prove that he could say whatever he wanted, whenever he wanted. Fans attending this season’s Uefa Champions League final will be scanned by face recognition cameras in Cardiff’s Principality Stadium as part of a police operation. Faces will be scanned at the arena – formerly the Millennium Stadium – and Cardiff’s central railway station. South Wales Police said the image can then be matched against hundreds of thousands of ‘custody images’ stored by regional forces. The stadium can hold around 74,500 spectators, while a further 100,000 fans are expected to travel to Cardiff for the June 3 game. The Champions League semi-finalists who could reach Cardiff are Real Madrid, Atletico Madrid, Juventus and Monaco. The BBC news website said police intend to use the system to scan faces at various locations, but it will not be a condition of entry to the stadium. Police said the operation is an attempt to further test Automated Facial Recognition (AFR) technology. “The Uefa Champions League finals in Cardiff give us a unique opportunity to test and prove the concept of this technology in a live operational environment, which will hopefully prove the benefits and the application of such technology across policing,” South Wales Police said in a statement. The operation will build on previous police use of AFR technology by the Metropolitan Police during last year’s Notting Hill Carnival. Speaking to the Motherboard tech news website, Tony Porter, the UK Government’s surveillance camera commissioner, said that police must use the technology in compliance with the UK’s surveillance camera code of practice. “My office has been in touch with South Wales Police to help them ensure that when deploying AFR they are complying with the code [of practice],” he said.